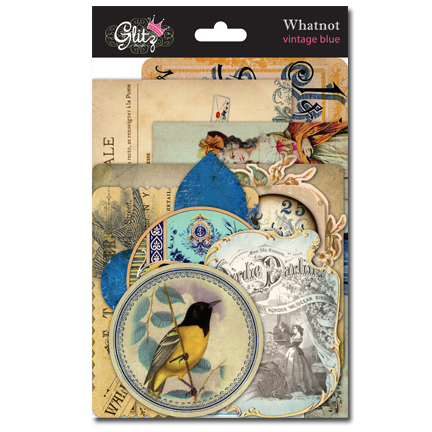 Glitz Design: Introducing "Vintage Blue"
Loving all your responses so far to "Dance In Sunshine!! Don't forget, comments are open for the possibility to win the new collection until July 20th! 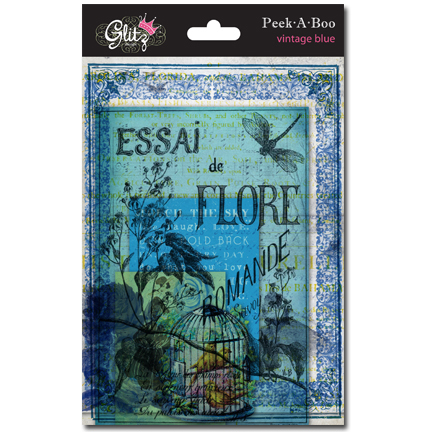 Today we have another new collection to share with you called Vintage Blue. You are going to just LOVE this one! The rich colors are amazing, and the vintage feel is just PERFECTION!! Without further ado...here is a closer look at Vintage Blue. Isn't this such a fabulous collection?!! I just LOVE the colors, and beautiful vintage feel of it!! 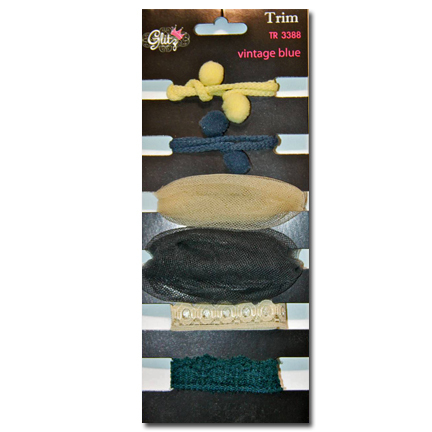 I bet you would like to win the entire Vintage Blue collection, wouldn't you? 1. Leave a comment on this post, telling us what you love most about Vintage Blue!! 2. Head on over to the Glitz Design Facebook page, and follow the instructions on sharing the link! Once you are done, come on over here and let us know that you "Facebooked" Vintage Blue!! I love the color combo! And those paper layers.. love! What a beautiful blue!! And the patterns, and the touch of yellow...Gorgeous!! love the blues and golds! this is so sophisticated! ***SWOON! *** Oh my word, this is so rich, elegant and dreamy! I love the romantic vibe of this and it's just perfect to scrap our wedding photos!!! Pardon me whilst I wipe my drool from thy keyboard! Ohhh my word Glitz you never disappoint. This is gonna be my FAVE release-WHOOP WHOP! I love the colors and the trim. It's on my to get list already. Oh, this one is beautiful too...I think i like this one better then Dance in the Sunshine...blue is just my color! So very pretty and elegant with a twist! :) LOVE! FB'ed it, and am in loooooove with this line!! i need two full sets, one to hoard, and one to use LOL! this is by far my favorite Glitz collection EVER -- I saw it TheScrapReview this morning and have been drooling over it ALL DAY!! it is SO delish! These are so beautiful, I can see all the potential layouts! This is such a gorgeous collection! I love the colours and patterns. Gorgeous. That color combo never gets old. I can't wait!! Love the blue and yellow together. Can't wait to see the individual pieces of whatnots and paper layers. I shared Vintage Blue on my facebook page. Love this collection! It has so many vintage images but I think my favourite has to be the bird images repeating through the line, especially on the accessories. Well done Glitz! This is gorgeous! I need this! I love the sweet epoxy words and the lovely trim!! Is it possible to fall in love with paper? I am just swept away by the fabulous true-blue colour and designs here. I'm gonna go broke buying all of these amazing collection :) Love them. Very soft and romantic. I really love the paper with the large rose and all the sweet words and sentiments. Love love love it. Really love some of those embellishments. Glitz has quickly become my favorite line of products. I have never been one to purchase an entire line of anything but have found myself doing that with Glitz. The Vintage Blue is my favorite line so far but absolutely love them all . . . your products make me feel right at home! I'm not very much a vintage person, but I NEED this collection - I just love the color combo and some of the embellies - like the trim, cut outs and paper "pad". I have shared on FB! What I love about Vintage Blue! I Blew me away! 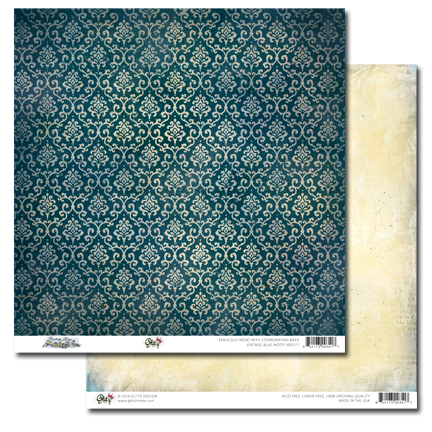 I love the colors the what nots are wonderful the pa paper patterns- wonderful! I totally adore the colours in this collection! Of course I shared the link of FB! My scrappy friends will love it! Wow, wow, wow. This is amazing! This is Fabulous...so gorgeous...my mind is racing with ideas on so many things I could make. The blue's, yellows, and holy wow LOVE the embelliez...everything is just so right. As usual Glitz you are totally RAWKIN my world with your designs. 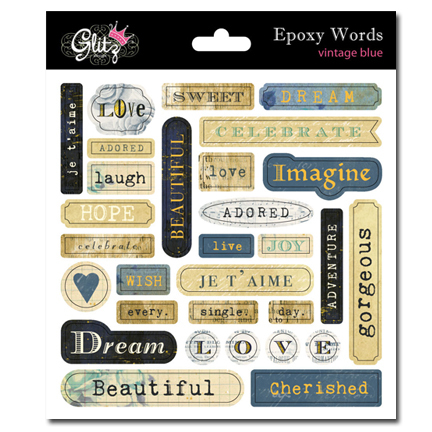 LOVE LOVE LOVE the epoxy words, and the blue/yellow! LOVE LOVE LOVE the blue and yellow. The epoxy words are my favorite. Love these colors and patterns! Love the color combo, and the trims are terrific!! I just Facebooked Vintage Blue!! 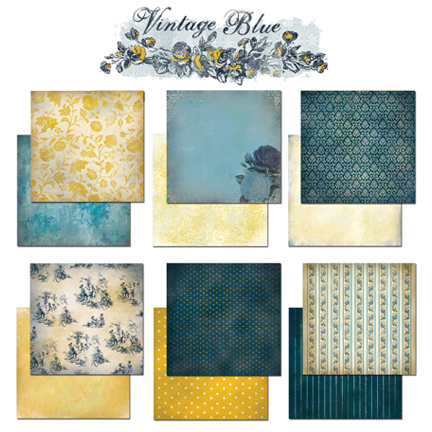 I love the richness of the colors in the Vintage Blue collection! They are gorgeous, and I will absolutely HAVE to have Vintage Blue! Gorgeous colors, gorgeous patterns and fantastic embellie packs!!!! I can't wait until I get me some!!!!! Omgosh - I just love this line. 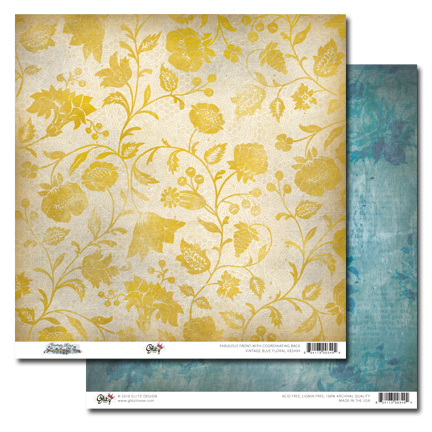 The blues and golds are divine - the Toile patterned paper is To Die For! Just beautiful! I can see some "Vintage Blue" heritage layouts in my future. The colours are so versatile! Just beautiful! What a gorgeous line! I love the roses and birds, and the beautiful blues. My faves would have to be the WhatNots and the Paper Layers. Every collection Glitz comes out with just get better and better and better. I love this one!!! 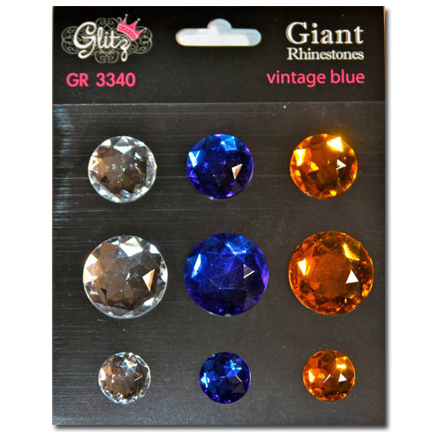 Now THIS is my fave Glitz line of all time! Gorgeous gorgeous gorgeous! Love, love love this line!!!Beautiful. Just have to have it. Oh how I love blue and this set just allows it to sing. So beautiful. I love the colours in this collection! The blues are gorgeous! I love this - the blue is very classic but whimsical too. love! 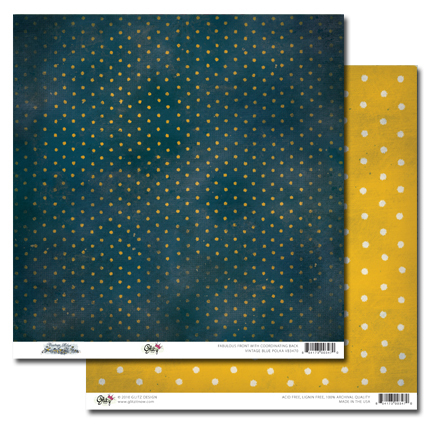 I am a HUGE fan of polka dots, and that beautiful blue paper - oh my goodness, but this is a MUST for my creative stash! And those birds! WOW! Wow, this is my favorite summer reveal I've seen! I just can't get over the deep blues + yellows! Wow! This line actually makes me want to scrap with blue - and that's saying something! It's so gorgeous and regal - it's fantastically versatile too! I love the blues and yellows!!! I just adore the color combination in this collection - the blue and yellow really seems to bounce off each other. love it! Oh wow, love these colours so much. 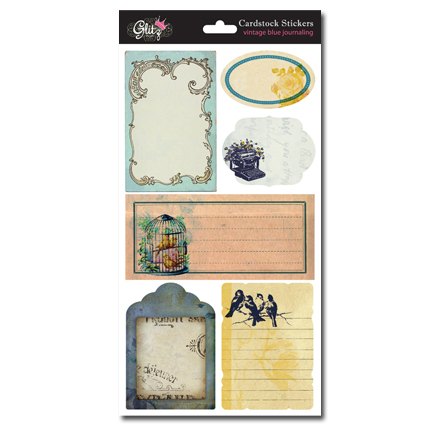 Perfect for gorgeous vintage layouts. And those coordinating embellishments are to die for too! I love this collection. The colour combination is heavenly and absolutely on trend (yellow and blue will be huge in fall too). My favourite colour is blue and I really love the Whatnots. They will be amazing on every project. great for boys or girls, vintage or modern romance. Love it!! Yummy! I want all of this one, love that shade of blue with yellow. i have only just discovered Glitz & WOW!! this is a beutiful collection. wot a divine colour combo. the little pack of wotnots look so beautiful! Terrific! Another fabulous line with wonderful accessories. The trims are my favorite. Love love love this!!!! The colors and patterns are just dreamy and so versatile!!!!! A definate Must-Have!!!! Awesome trims! This blue is right up my alley! This is absolutely beautiful!!! The colors are divine!! What a beautiful shade of blue and with the gold. Just stunning! loving the colors, birds and music and the theme! I LOVE LOVE LOVE this line!!! the blues are amazing and can go boy or girl which I LOVE!!!! perfect!! you guys nailed it!! You guys have really hit it out of the park this time! I facebooked Vintage Blue too! I love the Peek-a-boos - the look lovely! This is definitely my favorite collection. I love the vintage feel and the colors are amazing!! This is amazing! Love the cardstock stickers! I love this collection!!! It's so hard to find pretty blue paper! Soo pretty!! What a beautiful color combination! You really made this look elegant! OMG!!!! This line is gorgeous!!! I am so in love with the colour combo in this line. Of all three new lines this is by far my favorite! I just adore that blue, and it looks so beautiful with the golden yellows! I am a true blue fan. Great job on the new collections! This has to be my favorite of the new collections!! I LOVE all of it!! This is just so my favourite!!! The colours, the designs, the accessories are all MUST HAVES for me - LOVE it! There are no words left, it's all been said. These papers and embellishments are just stunningly beautiful. Thank you Glitz Design ! My favorite of all!!! Beautiful colors, sophisticated designs, fun embellishments, totally perfect!!!! I can't wait to get some to play with!! 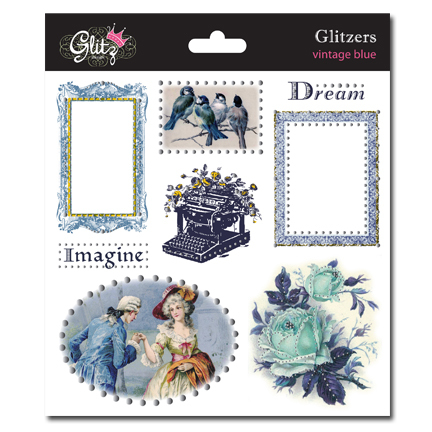 I'm SOOOOO in love with Vintage blue, can't wait to have my hands all over those papers and embellishments, I'm almost drooling LOL. Give more give me more!!!!! really liking the brocade and toile patterns! so pretty! I love the colors and designs! The layering papers are beautiful! This is my favorite of the new lines. I love the teal and yellow. This might be my fave!! Love blue and yellow together! Wonderful embellies! Totally gorgeous! Love the mood and the colors and the papers! I love that it is vintage but does not look old and worn, rather classy and beautifull. I love that for you guys Vintage doesn't have to be grungy. It's classy and Victorian. I love the trnasparencies and the blues. DIVINE! Now..to convince my LSS to share! Navy blue is a new favorite color of mine so I love that htis collection features navy! Such a beautiful blue and love it with the yellow. Love the divine colours of this collection and I'm totally in love with the paper layers, What Not and Peek a Boo. Gorgeous!! I have "Facebooked" Vintage Blue! Gorgeous!!! Love the blues and golds, the stripes, dots, flowers!! Prettiest set I have seen in a while!!! I LOVE LOVE LOVE THIS!!!!! I think this is my fave of the 3 new collections. Love the blue and yellow togetehr , it is jsut gorgeous!! vintage blue! reminds me of blue jeans and the 70's! great job glitz girls! the combo of yellow and blue's are out of this world... yet another line that just makes me happy! You have outdone yourselves. Glitz is definatly the company that put out the best lines this year. In my opinion of course! I just adore all of these!! the most fantastic about this collection is just this vintage blue!! I've fallen in love with it! This collection is at the TOP of my list! AWESOME collection! So pretty, and I love all the birds that are incorporated into it. This is my favorite of the three!! I love the color combo for vintage, the blue and gold. Also loving the birds and cages, very nice!! I want it!!! Such rich colors and can't wait to get my hand on those peek a boos! 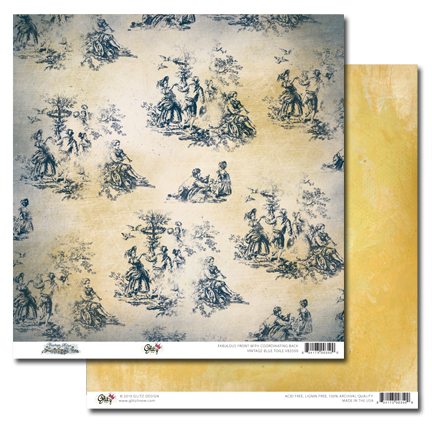 Love the colors and the toile design. The birds and other designs are fabulous. Stunning! what a perfect hue and color combination you gals have achieved here... yummy! Oh! What's not to love? The color tones of blue that you have chosen are just gorgeous! I can't wait to get my hands on all of this line!!! This entire collection is a must have for me. What fantastic colors and the embellishments are to die for! Blue is one of my most fav colors, and this collection has it all! I really love the peek a boo embellies! The color combo is gorgeous. I am drooling over that toile pattern. Oh, the deep, rich colors...the blue is perfection...what a shade! It's luscious and is begging to be used! Beautiful patterns! absolutely te most beautiful "Blue" series I have seen. The matches are perfect and so vibrant. Cudos to your designers. The colors are so wonderful together the yellow and navy two of my favorites. I adore this color combo! Beautiful new line! Love it! I love, love, love this set--all the blue and gold, my fav color combo!! Lve the blues and oh my the whole kit. This is so rich! Love the navy blue, and the toille paper! Would love to have that! 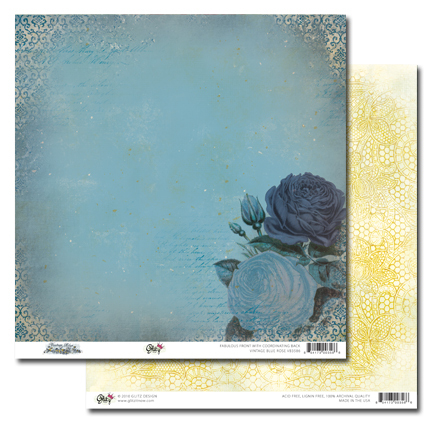 Really like the blue and yello combination and my favourite pieces are the paper layers - are there any stamps or did I miss those? What gorgeous paper! Luv the colors! I love the sheet muxic with the bluebirds and again I can't get enough of the Peek a Boo Blue! This is my favorite collection ever!! I have 5 boys and this is right up my alley for all the masculine Los I will be creating!! Ahhhhhhhh - Vintage Blue. This is absolutely stunning. I mostly love it because it takes me back to my childhood as I visited my grandmothers' homes and my aunts' homes. I especially love that you have used birds in the pattern. oh be still my heart it's gorgeous! my favorite release so far!!!!!!!! I think this is my favorite of the new collections, the blue is unique and gorgeous !! I love the blue roses. This is a gorgeous collection. I would love to play with all of it. The colors are so amazing and the embellishments...perfection to the "T". Anything done with these amazing papers and the entire line will be a knock out!! Love it!! 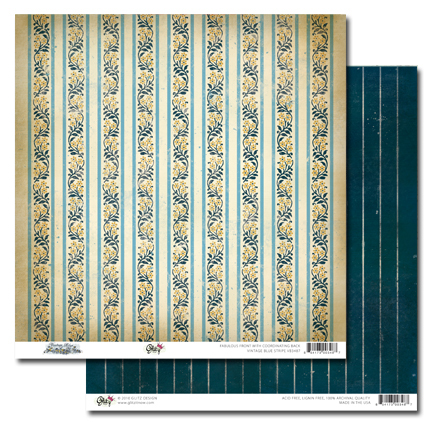 The blue and yellow paper colors are delightful - my two favorite colors in one great kit!! what a great opportunity to win this collection! Blue is my favorite color so of course I would love this collection. It's just divine. My favorite new collection! 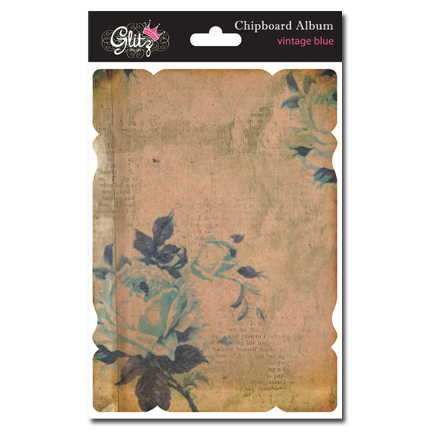 I love the vintage chipboard album. These are great. Blue is my favorite color and the embellishments are fabulous. I can see the papers layered with so many combos. 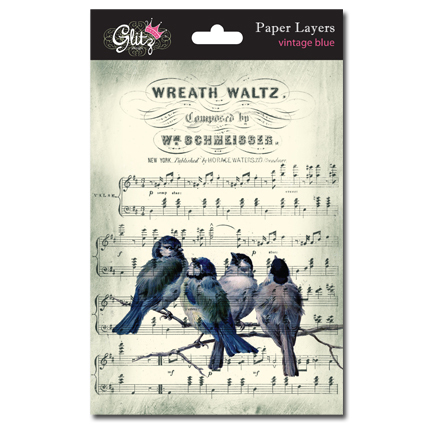 Oh my gosh the blue roses on the paper are sooo pretty & I love the paper layers with the music/birds. this collection is so serene and yet quite dramatic! i could get lost in the lush blues of this collection!!! A great collection, love this shade of blue. Thanks for giving us the chance to win one of these beautiful paper collections. oh! This is on my need to have it NOW list. Just love everything about it! I LOVE absolutely everything about this line!!! color, patterns and textures!! This one HAS to be my favorite. Love it, love it, love it! I happily passed along these new lines on my Facebook page. Simply freakin' gorgeous! Love the colors and how I wish there were really blue roses! All the coordinating stuff is pretty cool too. WOW!! Love the color combo of the blues and golds!! Inspiring!